As the 1918 influenza pandemic circled the globe, U-M Medical School Dean Victor Vaughan was called in to help unravel the mystery of the deadly illness. Victor Vaughan and two other physicians weaved through the military camp near Boston on a cold and drizzly September morning in 1918, observing the line of men who carried blankets with the last of their fleeting strength, most of them coughing and cyanosed. Blood leaked from mouths and noses. “There were not enough nurses, and the poor boys were putting themselves to bed on cots, which overflowed out of the wards on the porches,” one of the physicians remarked. It was a sight Vaughan would never forget. “This picture was painted on my memory cells,” he wrote afterward — a picture of “the deadly influenza virus [that] demonstrated the inferiority of human inventions in the destruction of human life.” On this day, at this camp, 63 men who had survived World War I would die from influenza. Vaughan (Ph.D. 1876, M.D. 1878) was dean of the U-M Medical School at the time, a position he had held since 1891. From the time of his groundbreaking work on separating arsenic from other metals in 1875 until his death in 1929, Vaughan made important contributions to the fields of chemistry, medical chemistry, epidemiology, and public health. A colonel in the Army Medical Corps who also had served as president of the American Medical Association, Vaughan was ordered by Army Surgeon General William C. Gorgas, M.D., to Camp Devens in 1918 to investigate the deadly disease that was ravaging the camp and the country. Nothing could prepare him for the sheer vastness of the scourge — what would later be called “the greatest medical holocaust in history.” By the time the epidemic (sometimes called the Spanish flu, though we now know Spain was not the point of origin) ended, an estimated 650,000 Americans and 50 million people worldwide lost their lives. “Countless more were left without parents, children, friends, and loved ones,” notes the Influenza Encyclopedia, an online resource that is produced by the U-M Center for the History of Medicine and the Michigan Publishing unit of the University Library. Treatments were hopelessly outdated and inadequate. The absence of vaccines and antivirals, coupled with the shortage of physicians in the U.S. and around the world after the war, led to mounting death counts. Poor nutrition and sanitation further intensified the spread of the disease. Vaughan saw hundreds of “stalwart young men” in military uniform, sick and crowded onto cots and floors throughout Camp Devens. ... It was a sight Vaughan would never forget. He collected data that indicated typical influenza was present at many U.S. camps in March and April 1918. “It came suddenly, lasted for a few days, and disappeared as quickly as it came,” Vaughan said in a 1919 interview with the Journal of the American Medical Association. He compared infection and death rates among a variety of military camps, and learned that men who had gotten the flu in the spring of 1918 seemed protected from the second wave in the fall. Vaughan looked into data from Camp Shelby, where a division of 26,000 men encountered the first wave in April 1918, with about 2,000 men falling ill, science writer Gina Kolata recounted in her 2001 book, Flu. In October, the virulent form of influenza struck the camp and confined itself almost exclusively to the summer recruits and “scarcely touched the men who had lived through the epidemic of April,” Vaughan wrote. In addition to the valuable information he tracked regarding immunity, Vaughan also sounded an alarm about mounting mortality rates: “If the epidemic continues its mathematical rate of acceleration, civilization could easily disappear from the face of the earth,” he said. Yet almost as quickly and mysteriously as it raced around the continents, the flu pandemic subsided in 1919 and officially ended in 1920. Estimates about how many people died from the pandemic vary from 50 million to 100 million — a staggering 3 to 5 percent of the world’s population, and far more than the number that died in World War I. While Vaughan and his colleagues helped with the understanding of the pandemic at the time, it was not until 90 years later that researchers announced they had discovered why the 1918 pandemic was so deadly: A group of three genes enabled the virus to weaken a person’s bronchial tubes and lungs, making way for bacterial pneumonia to take hold. Researchers in 2014 lent insight into the reasons that older adults were not as affected as younger people: People born after 1889 were not exposed as kids to the kind of flu that struck in 1918, leaving them uniquely vulnerable. Older people likely had some immunity due to earlier exposure to an H1N1-like virus, which was closely related to the 1918 flu. Vaughan died in 1929, when the mystery remained largely unsolved. It haunted him. Yet he wrote and spoke little about his experiences in 1918, dedicating only a few paragraphs to the pandemic in his 500-page memoir. Science writer Kolata pointed out this oddity in her book about the pandemic and suggested that the scars of witnessing such a massive tragedy made Vaughan and others shy away from a full recounting. When did the first influenza cases reach Detroit in 1918? Which U.S. cities closed public squares and theaters to slow the spread of the virus? Why did Los Angeles experience a lower death rate than most other U.S. cities? (Left) A Cincinnati Board of Health streetcar sign. (Right) Red Cross volunteers assemble masks at Camp Devens in Massachusetts, the same camp Victor Vaughan visited. Photos courtesy of the Influenza Encyclopedia and the National Archives. Answers to these questions are included in the vast quantities of information collected in the Influenza Encyclopedia (influenzaarchive.org). The archive stems from a collaboration between the Center for the History of Medicine at U-M and the U.S. Centers for Disease Control and Prevention that resulted in an article in the Journal of the American Medical Association in 2007 (“Nonpharmaceutical Interventions Implemented by U.S. Cities During the 1918–1919 Influenza Pandemic”). The first edition of the digital encyclopedia was published in 2012, followed by a second edition in 2016. The site includes substantial data and narratives from cities (now totaling 50) and additional documents that add considerable depth to the overall story of the pandemic. By putting so many original documents and stories online, “we are definitely bringing history into the 21st century,” says Howard Markel (M.D. 1986), Ph.D., the George E. Wantz Distinguished Professor of the History of Medicine and director of the Center for the History of Medicine. The project has involved extensive fact-finding, as well as the scanning and digitization of articles by researchers and librarians. The technical work leading to the second edition took about four years of effort from the Center for the History of Medicine and the Michigan Publishing unit of the University Library, says J. Alexander Navarro, Ph.D., assistant director of the Center for the History of Medicine. In all, the Influenza Encyclopedia includes more than 20,000 records, including photos, scans of newspaper articles, and public health announcements, that are frequently accessed by historians, journalists, and the general public. For more information, visit influenzaarchive.org. “Biography: Victor Vaughan.” American Experience, PBS. Byerly, Carol R. 2010. “The U.S. Military and the Influenza Pandemic of 1918–1919.” Public Health Reports 125 Suppl. 3:82–91. Cole, Rufus. 1936. Letter to Simon Flexner. Gram, Franklin C. 1919. “The Influenza Epidemic and its After-Effects in the City of Buffalo: A Detailed Survey.” Journal of the American Medical Association. 73:890-891. Jones, Dan et al. 2018. “Three Percent of the World’s Population Died in the 1918 Flu Pandemic.” History.com. Jordan, Edwin O. 1927. Epidemic Influenza: A Survey. American Medical Association. Kolata, Gina. 2001. 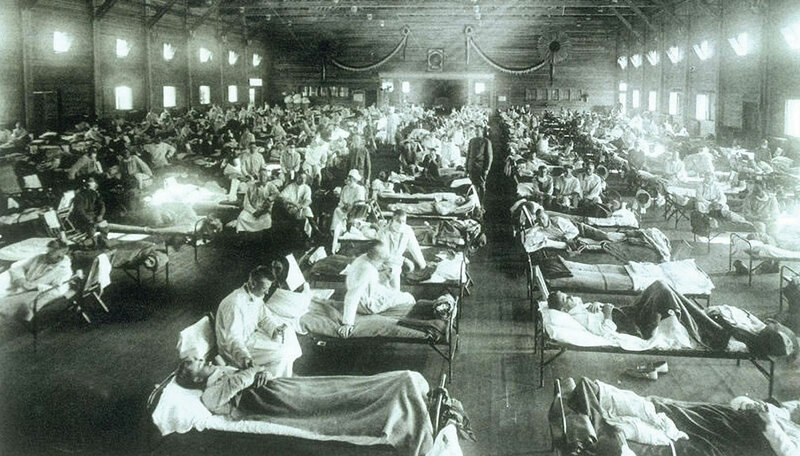 Flu: The Story of the Influenza Pandemic of 1918 and the Search for the Virus that Caused It. Touchstone. Markel, Howard et al. Influenza Encyclopedia, University of Michigan. Stern, Alexandra Minna; Markel, Howard; Cetron, Martin S. 2010. “The 1918–1919 Influenza Pandemic in the United States: Lessons Learned and Challenges Exposed,” Public Health Reports 125 Suppl. 3:6–8. Vaughan, Victor C. 1926. A Doctor’s Memories. The Bobbs-Merrill Company. Vergano, Dan. April 29, 2014. “Mystery of 1918 Flu That Killed 50 Million Solved?” National Geographic. Worobey, Michael et al. 2014. “Genesis and Pathogenesis of the 1918 Pandemic H1N1 Influenza A Virus.” Proceedings of the National Academy of Sciences. 111:8107–8112.